and black color, with 35 years experience. daughter of ARKO v.d. Bergstrasse and ARINA Gedania. daughter of KAPRYS Blekitna Radunia and EFNA Blekitna Radunia. daughter of Ch.PL IDOL z Husarskiego Kapolinu and ARIKA Amigo Perro. daughter of Ch.PL MRUK Patland and EFNA-EOS Amigo Perro. daughter of GOLF Amigo Perro and ZJAWA Radosc Jesieni. daughter of Int.Ch.PL ACHILLES z Blekitnych Wydm and HONDA Amigo Perro. and Ch.PL LADY LAGUNA Amigo Perro.FCI. son of Ch.PL BILL Fripon and ARIKA Amigo Perro. son of Int.Mult.Ch FLORIAN v. Mendener Berg and Ch.CS HETTY Bessen CS. son of Int.Mult.Ch. TRISTAN Bessen CS and Ch.PL, Jun.Ch.PL KARINA Amigo Perro.FCI. III place in competition of "The Best Breeding of Great Dane". 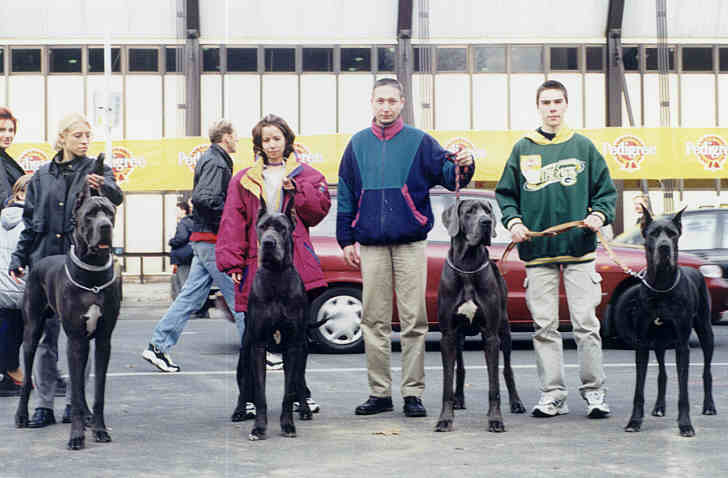 THE BEST BREEDING OF GREAT DANE'1999 on The Club's Show in Lodz. THE V-ce WINNER in EUROPE'2000,getting res.CACIB & CAC. THE WINNER OF LITHUANIAN'S CLUB. on The Club Show of The Great Dane in Kaunas on Lithuania. "THE JUNIOR WINNER OF EUROPEAN GREAT DANE CLUB - Eu.D.D.C'2003"
"THE JUNIOR CLUB'S WINNER OF THE YEAR'2003"